•	In House Examinations are held for 1st, 2nd, 3rd, 5th and 6th year students prior to Christmas. •	The examinations are held in late November or early December. The intention is to have all papers corrected and the results sent home before Christmas. •	The Mock Examinations are held for 3rd and 6th years in the second term – generally in February before the mid-term break. •	These Examination Papers will be sent to an outside agency for correction. Parents will be notified early in the academic year about this arrangement and a fee will be charged to parents for the correction of their sons’ papers. •	Examinations are held in the last week of the academic year for 1st, 2nd and 5th Year students. •	These reports are sent to parents as early as possible. 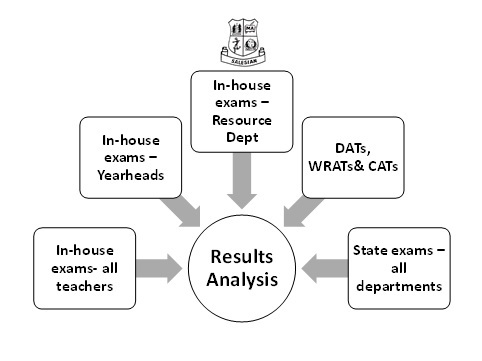 All teachers are involved in collating data on examination results as well as DATs, WRATs and CATs.